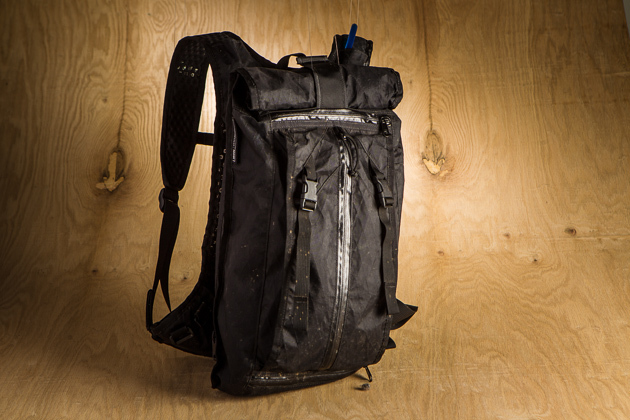 San Francisco-based pack and clothing brand, Mission Workshop, is most known in the urban commuter segment, but the Hauser 14L pack, along with the company's mountain-bike-specific ACRE products, are quickly cementing them in the off-road world. The Hauser is ACRE's first entry into the hydration pack market. At 14 liters of capacity, I would call it a medium-sized pack. It uses a waterproof ripstop nylon outer fabric with a nylon ripstop waterproof laminated liner. Add in watertight zippers and there is a lot of emphasis on the pack's ability to shrug off the elements. Much like the difference between water resistant and waterproof, ACRE calls the pack “weatherproof.” So, having a full arsenal of waterproof dry bags myself I was curious as to how weatherproof the pack actually is. The majority of dry bags stay away from zippers in favor of roll or Ziploc type closure systems. I have found that even the best engineered watertight zipper systems just don't hold up well. They may start watertight but eventually they will leak. Needless to say, I was a bit skeptical. What I found is that in most conditions the pack will keep your things bone dry. The fabric itself does an excellent job of repelling water. However, in a deluge or if submerged, water does sneak past the zippers and the roll top. All in all, I think weather resistant is a more fitting description. The main compartment is accessed via roll top. Water resistant zippers keep most of the moisture out, but in a downpour it still might be a good idea to keep your phone in Ziploc. I found it to be comfortable and lightweight yet burly. I have no doubt that it will easily outlast other packs on the market; hell it will probably outlast me. 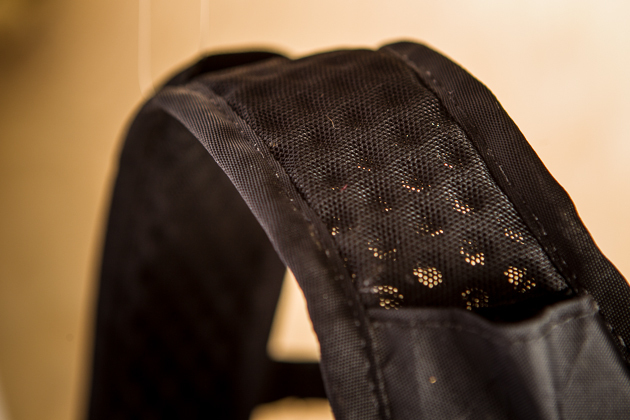 The shoulder straps have multiple anchor points to fine-tune the fit. A perforated back panel helps to keep sweaty back to a minimum and I appreciate the thick waistband, which is also removable. 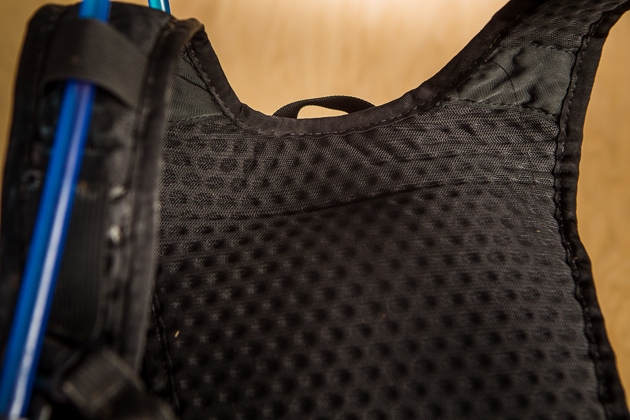 Perforated foam shoulder straps provide comfort and breathability. The back panel is highly breathable as well. The main compartment is accessed only from the smallish opening at the top, this makes finding things at the bottom a little tricky; the likelihood of discovering a fossilized energy bar hiding down there in a couple of years is high. I did however find that the combination of the shape and waterproof inner liner made for a fantastic beer cooler. One of My favorite features of this pack though is the tool roll. I love tool rolls, they keep all your repair items in one place and allow you to roll them out next to your bike trauma, plus you can easily move it from pack to pack. Unfortunately my pump is too long to fit in, so keep in mind you may need a shorter pump to fully homogenize your roll. 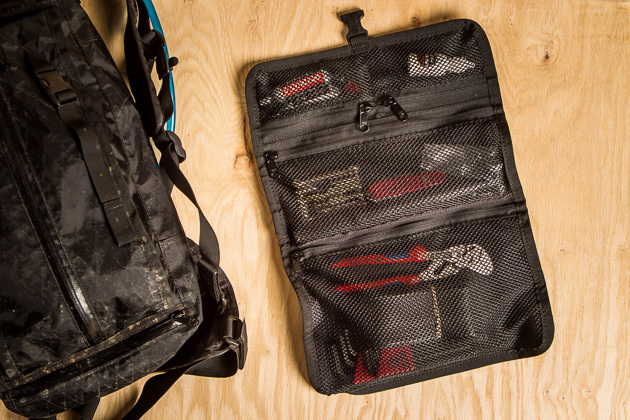 The tool roll keeps even full-size tools neatly contained and easily transferable between packs. I like this pack. It's well made, tough and weather-resistant, with a simple low-profile design. At $205 sans bladder it is on the high side in comparison to other packs, but if it lasts forever, who cares. And best of all, it's made in the U.S.A.